In Malaysia they are trying to phase out signing when you use a credit or debit card, in favour of using a PIN number. But below a certain figure, RM250 in Cold Storage, for example, you can just wave your card over the reader to pay. As there are CCTV cameras everywhere – some that would see the number you punch in if you use a PIN, I would prefer to use the wave payment instead, as it would be more secure. Alternatively, check around for CCTV cameras first to see if you can input the PIN securely. But don’t forget to use cash – if you don’t use it you’ll lose it as banks (and their governments) would prefer to go cashless – then everyone is a captive customer, and they’ll be able to charge you for having an account instead of paying you interest. And, of course, it gives governments almost total control over you, as if you don’t cooperate, they simply freeze / confiscate your electronic money – and you won’t be able to buy or sell any more – including useful things like food. From the beginning of this month – November 2016 – the Malaysian government has tightened rules on duty-free purchases in Langkawi and other duty-free islands. As a resident in Langkawi, or as a visitor, it is now less attractive. You are restricted in the volume you can purchase, and where you can purchase duty-free. It appears, for example, that eating at a restaurant you will have to pay duty for wine etc. with your meal. If you want to use a car you have purchased duty-free on the island on the mainland you will have to pay a very high bond, apparently. Overall, apart from making me less likely to visit Langkawi again, it doesn’t really affect me, living in Penang as I do. If you think it might affect you please check yourself, as I have only briefly read about it and don’t know the complete details. Keep an eye out for GST mistakes. To illustrate, it is easiest just to tell my story. Before I start, let me just say I bear no ill-will towards Cold Storage for this incident. Mistakes happen. The government has forced huge costs on businesses (and thus consumers) by making them unpaid tax collectors, and businesses would have wanted to keep their costs in implementing this as low as possible. Mistakes are likely. 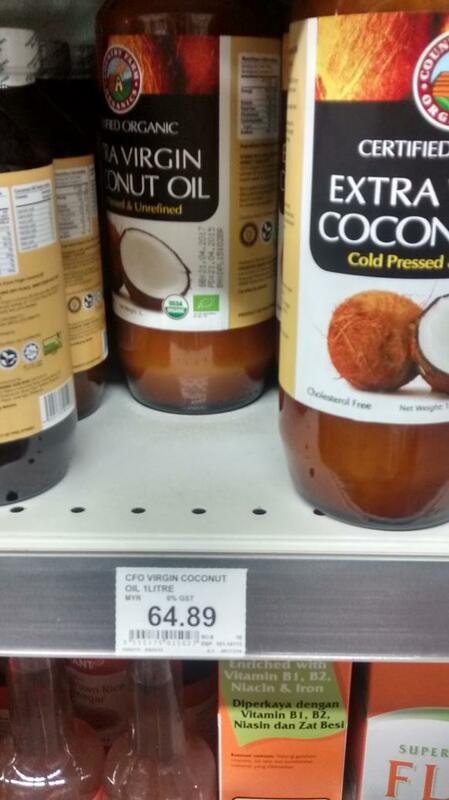 I only wanted to buy coconut oil, glanced at the price, picked it up and went to the checkout. I paid in cash, and when I received the change, as I vaguely remembered the price, thought I had been overcharged. So I queried this with the cashier, and she showed me the price on the receipt. She had given me the correct change according to the receipt. 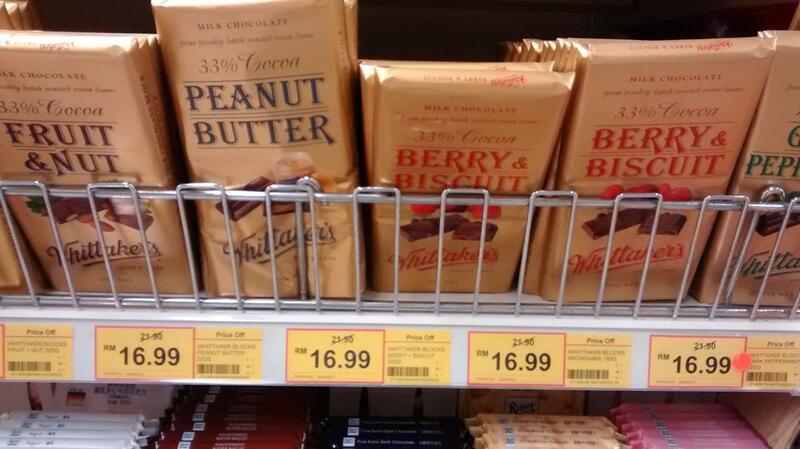 Something seemed wrong, so I returned to the shelf and photographed the price and GST rating there. 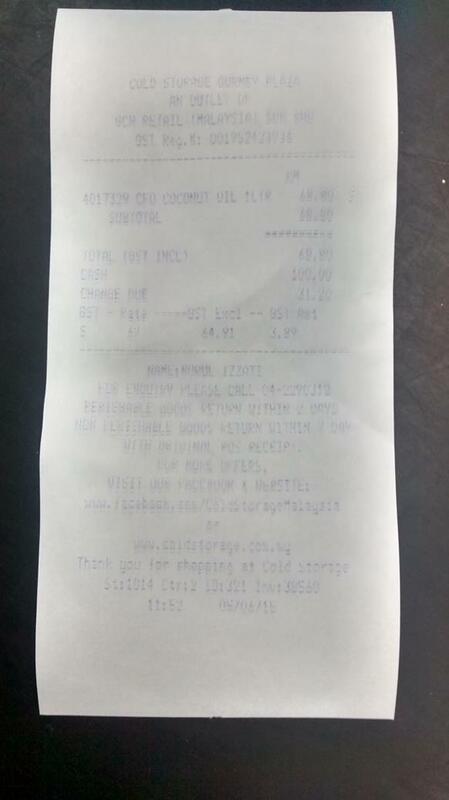 The price on the receipt was RM64.91 ex-GST, but the price on the shelf was RM64.89. Now, the government has decreed that the price indicated must include GST. So the proper price should be as shown on the shelf. And GST was added, by mistake, to a slightly different price for the product. This is three mistakes. As is usual here, you explain the problem to one staff member, they go and get another staff member – and you have to explain all over again. Then they go and get another staff member, and you start again from the beginning and explain it all again. The shelf photo I had taken made it easy for them to understand. So, the fourth staff member gave me a huge form to fill out, I said, as usual, I’d only fill out my name and phone number, and then I got my RM3.90 back in cash. And they apologised nicely and shook my hand. As much as possible I try to avoid buying products that have GST on them, so for me this was the main point in this exercise once I had found the mistakes. I’m not a big shopper. But in one week of normal shopping, buying the odd thing, eating out or having a drink, I notice how much more most things cost. 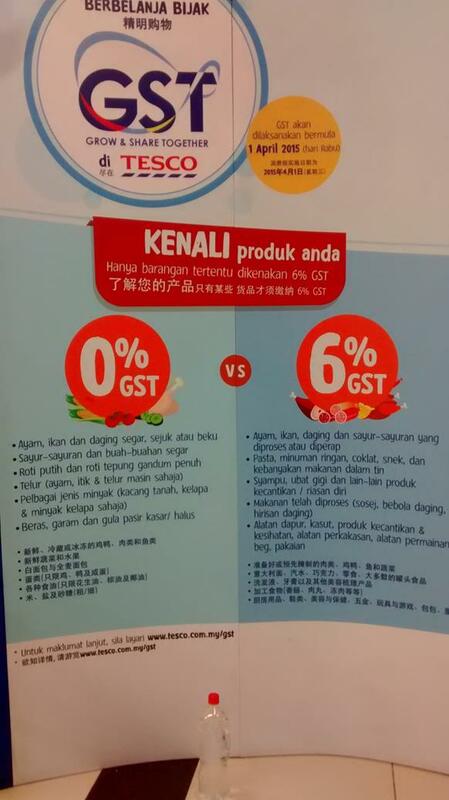 This is, of course, due to the 6% GST, but also due to retailers and establishments hiking their prices in addition. I can understand this to an extent, as a business being a tax collector for the government incurs accounting, handling and software costs which would have to be passed on to the customer. Thus the cost to the customer is presumably in excess of the 6% GST. However, it seems to me some of the price rises are greater than these extra costs would justify. At Eurodeli the other day the 3 drinks for RM39++up until now has become 2 drinks for RM40++. ++ was 10% service charge and 6% government tax. The new ++ is 10% service charge and 6% GST. One drink increased from RM13 to RM20. The same deal has disappeared from the Tree Top Bar. But at Daiso, where everything was RM5, each item is now RM5.30 – so 6% more – no price gouging here, just straight addition of GST. I’ve been admonished that my blogs on GST are one-sided. What about the price drops? Well, if you buy a car, on some models you may save RM100 or a little more. If you buy a Merc. you might save considerably more. Another friend wrote in a comment that this extra tax was the straw that broke the camel’s back, and expats are leaving for other countries. Namely Indonesia, the Philippines and Europe. Reading the US “Money” magazine recently, I spotted an article on retiring abroad. They quoted monthly costs for living in some other countries – Malaysia USD$1,500, Ecuador USD$1,500, Malta $2,000, Mexico $2,200 – that’s all I remember. They also recommended renting, as opposed to buying, so I assume this amount includes rent. Just looking at Malaysia, where $1,500 buys RM5,400, I think this is hardly realistic. And the USD is much higher than it has been for a while. The magazine appears to be aimed at middle class Americans. Renting a condo of a suitable standard would cost at least RM4,000 alone. Even if they lowered their standards they’d have to pay RM2,500 for rent. Then, renting a car long-term. And normal living costs. I think they would have to really cut back to live on this amount. It is certainly not impossible, but they would have to live quite differently from what they are used to. It’s been a while since I was in Malta or Mexico, so I have less of an idea of living costs there, but I doubt the figures for Malta are realistic, too. So as much as I hate yet another tax, and the suddenly increased cost of living, I am not moving. If you are footloose and renting, without too many possessions, it may be worth the trouble. I didn’t plan anything well. I should have done the shopping on Tuesday, pre-GST, but circumstances made it impossible. So on day GST +2 I shopped in Tesco. I ended up paying GST on about 40% of my purchases. I buy a lot of fruit and vegetables, which are exempt. What I noticed was that prices have increased a lot – but not all to the same extent. Soil was RM1.40 last year, until they raised the price to RM1.90. Now they have increased the price to RM2.00 – so slightly less than 6% – but that’s on top of last year’s huge rise. I didn’t note the prices before, but sort of remember some of them. Alcohol prices seemed to increase far more than 6%. Cheese went up a little over 6%. Then I noticed with chocolate they were doing one of their tricks. They call their regular price a special, and the new higher price as the regular price. Although in this case I think the regular price was around RM18 a couple of weeks ago. My general impression was that they have taken the opportunity to increase prices by more than the GST, sometimes far more. In the afternoon I bought a new consumer article – I had been waiting for it to go on sale in Malaysia. There had been no sales tax before, so it now cost 6% more. It wasn’t available before April 1st. On GST + 3 I bought a cup of coffee in Starbucks. Ugh. GST again. So it cost more. Almost every time I buy something I seem to be slugged with the new tax. Thus I feel like a large increase in the cost of living has been imposed on me. I will try to find a way to spend less, particularly on anything that has GST on it.